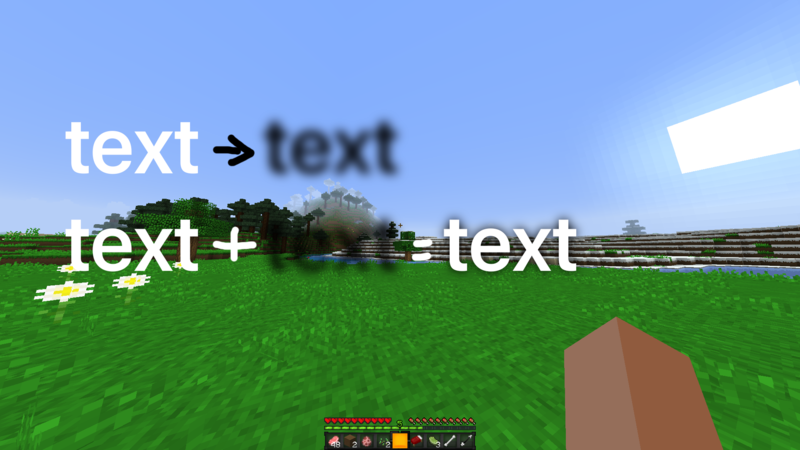 I would like to know how to take a text object rendered using the default Minecraft font renderer and add a drop shadow behind it. I believe what I need to do is make a copy of the text object, change its color to black, and blur it. The problem is that I don't know how to put the text object in a frame buffer by itself and only apply blur to it. I also don't fully understand the internal Minecraft shader engine, but if you do, hopefully you can lend your knowledge. Browse other questions tagged shaders lwjgl minecraft-modding text or ask your own question. How to put OpenGL in a state for drawing blended, colored, nontextured polys? Source code of Minecraft servers? Minecraft Bedrock behaviors: drop items for player/owner?